The People’s Mosquito project is like the proverbial swan – not much going on visibly but lots of action happening below the surface! What’s so frustrating for us – and no doubt for you, our supporters – is that most of it is stuff that’s not appropriate for public broadcast: negotiations, red tape, more red tape and more discussions. We are aware that we have been rather quiet recently, on the news front, and we apologise for that and want to take this opportunity to give you a bit of an update on the progress of the project. For the main part, we have been negotiating on the airframe identity, more on that below, and sorting out human resources within the team. Most of the key roles are covered, but we still need to engage a Director of Fundraising…and finding one is proving a challenge. We need someone who has executive and strategic experience in the field of fundraising and sponsorship to help us develop a successful strategy to raise the enormous funds this project will require. If you know of anyone who might fit the bill, please get in touch. But, be warned, they will need to be undaunted by a challenge! On the upside – we have a great management team here and are loads of fun to work with! We have now produced a comprehensive budget along with a detailed business plan, and have been in contact with various specialists across the world with regards to restoration of the airframe, engine and systems procurement and the sourcing of many other parts. After rather protracted negotiations, we have recently secured the remains of Mosquito NF.36 RL249, along with the all-important identity. Although the remains were nominally donated some time ago, we have had to cement the proprietary rights legally by purchasing them. The identity, importantly, gives TPM something to base the restoration project on. The remains themselves, being in various states of disrepair and generally unfit for use, will be used as models or templates, where possible, to re-engineer parts that are becoming more scarce and more difficult to find. Following our poll last year to determine which was the favoured Mark of Mosquito, we have thought long and hard about the results, which showed an overwhelming vote for the fighter bomber version, the FB Mk. VI (55% of votes against six other Marks). The poll originally came about as a response to the many negative comments we received regarding our original plans to restore RL249 to its original Mark, the NF 36, the “Bullnose” Mossie. So, as a result, and after much navel-gazing, thought and discussion, we have made the decision to restore The People’s Mosquito as an FB Mk. VI. We understand that this will be a surprise and a disappointment for some, but to the majority of people this version of the Mosquito embodies the very marque itself. We still intend to use RL249 as an identity, while making certain alterations to the look of the aircraft – in main, for example, the nose will carry not radar, but four replica .303 Browning machine guns. Moving forward, we intend to re-adapt the aircraft every two years or so between an FB Mk. VI and an NF II – which guise would give us some exciting paint scheme options – e.g. all Matt Black or Sea Green/Sea Grey over a Matt Black underside, depending on which version, squadron and year we would be using as a basis. We are also considering adapting the aircraft to represent the FB Mk. XVIII (Tsetse) at some time, as part of the cycle. This move – which we realise is a major shift in our plans – reflects our stated educational ethos and, vitally, will allow us to present the Mosquito in several of its wartime roles and will be an exciting addition to the airshow circuit, year to year. It will be like having three flying Mosquitos! We respectfully ask for your support in this move. We believe it is the right thing to do, for the charity and for the public – both donors and spectators. We are updating our branding to reflect this move – so look out for the new logo. You will notice that we have revised our strap-line to read “To Fly – To Educate – To Remember” which we feel better encapsulates our objectives and ethos as a charity. Now that we have finally secured the identity, we can start to take some significant steps towards our goal. The HR situation notwithstanding, we are currently moving forward with our fundraising strategy and will be launching that soon. Donations, in the most part, will be handled via an online platform. Details on which route we go with this are yet to be confirmed, but we are looking at crowdfunding the project in viable and realistic tranches on a platform such as Kickstarter. The hold-up has been partly down to the amount of time it takes to do the paperwork – registering with HMRC (which will enable us to utilise the Gift Aid scheme among other benefits), finalising banking details etc., and this due to the fact that we are spread around the world, and all doing this in our “spare” time. As you may be aware, The People’s Mosquito Ltd is a charitable company, being a “Company Limited by Guarantee”, in the official jargon, which means we don’t have any shareholders or pay dividends. All profit is retained by the charity for use in the project. The next step: becoming a registered charity, will only be an option for us when we have achieved an income of over £5000 in a twelve month period. This is a major target for us. Being a registered charity will give us certain financial and tax benefits, as well as making it easier to raise funds while offering a greater degree of confidence to our supporters, donors and beneficiaries that the charity is legitimate and working within a regulatory regime. Another target for us this year is getting out and about and meeting as many of you as possible to spread the word and, importantly, start raising some funds for the project. We hope to be visible at some of the major UK airshows this summer, but can’t give any more details yet. We will let you know which shows we’ll be attending as soon as they are confirmed. We will also be offering TPM branded goods on-line, either in a web-based store or via eBay, where you will be able to show your support by spending lots of your hard-earned cash on some TPM Mossie goodies! All for a very good cause, we hope you’ll agree. You will also soon be able to show your support or donate to TPM whenever you buy or sell on eBay through the eBay for Charity scheme. Along with this, we’ll be starting a major PR push, aiming to get as much media coverage as possible to get the message out to a wider public. Recently there has been a fair bit of speculation and comment on the social media sites regarding Glyn Powell’s New Zealand-based Mosquito T Mk. 43, NZ2308. As you can imagine, the team have discussed this opportunity at some length, since we heard at the start of the year that Glyn was looking to sell. In early February we had a meeting with Glyn and his partner, and grandson, Matt, where we talked through the options and possibilities of bringing the aircraft to the UK. Unfortunately no agreement was made at that meeting or subsequently. We would, of course, love to be in a position to purchase the aircraft. The airframe is in a fairly advanced state of build – which would significantly shorten time-to-flight status compared with a new build. However, as you may be aware, the aircraft is now on the open market and the fact is we just don’t have the funds and don’t believe – even with the impending fundraising launch – we could raise the amount required before the opportunity is gone. Glyn and Matt are running a business, not a charity, and they are quite rightly asking a market price for the aircraft. However, should TPM be able to raise the required deposit, in good time, then both parties would be agreeable to negotiating a contract to acquire the aircraft. So if anyone out there has a spare couple of million, now’s the time to stick you hand in the air! But, regardless of whether or not we will be able to enter those negotiations, one way or another, we will get a Mossie back in the UK skies. We will be making further announcements over the next few weeks – we will be posting details and info on our website, on Facebook and Twitter as soon as we can, in an effort to keep everyone informed of progress. We ask you to continue the good work for the time being in spreading the word and getting people on board. In the mean time, we thank all our supporters for their patience. We have always been clear that this would take a long time to get going – and thank everyone out there for their continued support. A colleague informs me the photos you show of wooden components are from the New Zealand build not UK have you not got anywhere with small sections thus far if not why can’t you do this. I have been in car restoration and the smaller items where always worked on in the background as it where while waiting to progress with the main parts. Hello Mr. Hoover thank you for your query. Indeed many of the images of the wooden components are for a build for a US collector done in New Zealand. However what we have in place with our supplier Aerowood (whom are aligned with NZ CAA and subsequently UK CAA) was that our ‘wing ribs’ were manufactured at the same time. These are now complete and we plan to show these parts in due course. The cost of these ‘small parts’ were £50,000 and are made to the paperwork trail standards of the CAA. We are working in the background on collection of spares, parts to reverse engineer and also securing major sponsorship in addition to our growing Club membership, aviation associations talks, direct marketing campaign and airshow appearances to raise large funds for the next stage campaign. I am pleased that at last the decision has been made to build a standard nose aircraft. This project has been around for several years now with not much sign of progress. With people being asked to contribute money, there should be more transparency. It would be good to see a business plan and accounts to date. Hi, Mossie enthusiast and thanks for getting in touch. The plan to build an FB Mk.VI was made public almost a year ago, on 16th March 2014, so we are a little intrigued by your “at last” comment, and are concerned that our communications methods are falling short. We are making progress, but slowly – and can do little more about that than we are currently doing. Firstly as we on the team are all working entirely voluntarily in our personal time and secondly, we are relying on public donations for the time being (until we are in a position to seek corporate sponsorship and Lottery funding) to move the project forward. We are in the process of registering the company as a charity (as you will be aware, it is already a charitable company, but being registered will help us enormously as far as approaching potential sponsors). As to transparency – we pride ourselves on the transparency of the project – it is very important to us to keep our supporters and the public up to date with what is happening with the project. The budget has been in the public domain for almost a year now and we try to put out regular updates when there is something to report. Our most recent major project update was our New Year report on the 3rd January. As to our accounts, the first year’s accounts are due shortly and will be available to anyone interested at Companies House, as per the relevant laws. please don’t make a TT39 replica, even a mother couldn’t love that! Don’t know where you got the idea we were going to build a TT.39. We’ll be building an FB Mk. VI. Technically it will be a restoration not a replica. Building a replica would be a whole different kettle of fish regarding certification. I found your site by accident when looking for Mossie paintings. Always, as long as I remember, had great interest in Mossie’s as an uncle (still with us aged 93) was a navigator in 540 squadron (PRU). He would dearly love to see one flying again. In my opinion the Mossie was the superior aircraft of WW2. Most people gravitate to the Spitfire. But the Mossie could do everything the Spit did – and more, and better. I always think that if aircraft production had concentrated on the Mossie we could have used it instead of the Lancaster and Wellington for bombing missions with far greater accuracy, fewer losses of aircraft AND crews. Low level rapid strikes were one of the Mossies finest attributes. That alone could possibly have shortened the conflict. As for funding this wonderful project, all I need is a Euromillions win and your problem would be solved….. I can dream can’t I? Good luck with the project. I am looking to donate. Hi Alan – thanks for your comments. Yes, we can all dream of winning the lottery and, as you say, funding would be no problem! You may well be right about the impact of more Mossie use during the war. The Mosquito certainly had a huge impact wherever it was used. I guess we’ll never know for sure though. Regarding your uncle, please send him our best wishes. 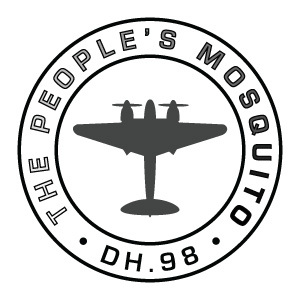 540 Squadron was the first to use the Mosquito and its insignia is our favourite – a simple mosquito (the insect). We will soon be launching our donations programme – so please keep an eye out for news on this if you want to donate. Thanks again for your support and for getting in touch. There are several mosquitos on museums, (at least 2 in the DeHavilland museum). Is it the case that no museum mosquitos are for sale or that they could never be restored to airworthy status? Hi Stuart – thanks for your question. There are a number of issues with restoring a museum piece. Firstly the fact that the Mosquito is made mostly of wood held together with a glue that was not designed for longevity. As you’ll probably appreciate, 70 year old wood and glue would not be fit for the stresses of flying. Therefore all the structure and surfaces would have to be replaced with new wood to pass the rigorous certification tests and partake in display flying. This would essentially mean scrapping a historical airframe. In our eyes this would be vandalism and I don’t think any museum would agree to allowing that to happen to one of their valuable historic – and rare – attractions and we wouldn’t want to be party to that in any event. i believe that it is an insult to all the crew’s,ground crew’s,production staff and people who owe this iconic aircraft thank’s for there way of life.To not have a flying Mossie in the country that made it is unforgivable!! it can be done,it must be done,not only for the sight and sound of a fantastic aircraft,But to honor the dwinderling number of pilot’s who flew and loved this icon and the many who’s last moments were with one. Thanks for your comment Simon. We wholeheartedly agree. It’ll be a long slog, but we’ll get there. as you say, it must be done. I would be more than happy to purchase a “T” shirt,hoodie etc,have stickers in my car in order to do my “bit”.I am 100 %,for this project.Regards.Mike. Thanks Mike. We’ll hopefully be having some Mossie goodies available for you soon. Thanks for your support. We will be launching our fundraising very soon.